The NASA Juno spacecraft blasted off on Friday, its aim, to discover more about the biggest planet in the Solar System, Jupiter. The Juno mission is uncrewed, but there are astronauts aboard, even if they are a non-human trio of 38 mm (1.5 in) high LEGO minifigures. The little-finger sized mascots represent the Roman goddess Juno, her husband Jupiter, and Galileo Galilei, the Renaissance astronomer who was first to spot Jupiter’s four biggest moons. To recognize his achievements, LEGO’s diminutive Galileo carries a telescope and Jupiter globe, which includes detail such as the cloud belts and the famed Great Red Spot. Juno carries a magnifying glass, while Jupiter holds a lightning bolt, as befits his status as god of sky and thunder. 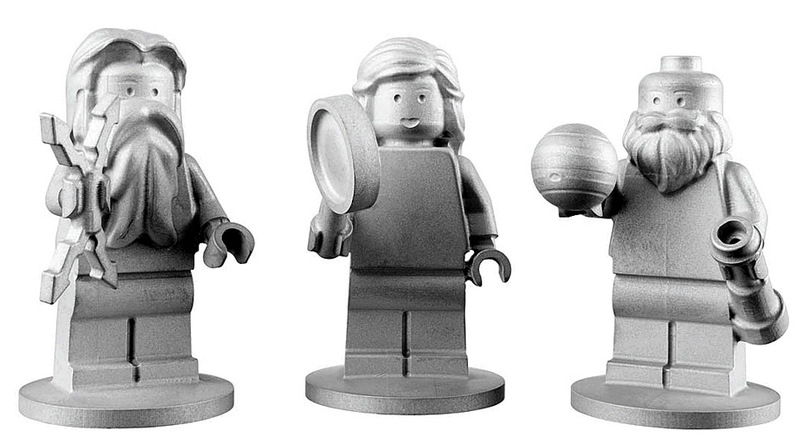 The figures are not made of the usual LEGO plastic though - instead, they are cast in durable aluminium. Juno will use triple rows of solar cells for onboard power. Mind you, the minifigures are well and truly doomed - after observing the planet Jupiter for a year, the mission will come to end, the spacecraft's circuits fried by the intense radiation belts it has been flying through. 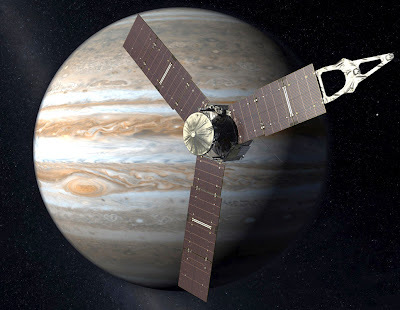 As a cleaning-up operation, Juno will then de-orbit, to plunge deep into the gas clouds of Jupiter. Eventually, both spacecraft and minifigure crew will be crushed by the titanic pressures far below the cloud-tops. No prizes for guessing the identities of the minifigure wearing the black helmet, or the one with green ears! The LEGO connection is interesting, as the Danish company is partnering with NASA to promote children's interest in science, math, engineering and technology - in fact, space themes are nothing new to this world of plastic construction bricks. There is a long history of space-related LEGO toys, from the Classic Space sets which ran from 1978-1987, through sci-fi themed sets such as Blacktron, M:Tron, and UFO. There’s also been Life on Mars, Roboforce, and the recent Alien Conquest. 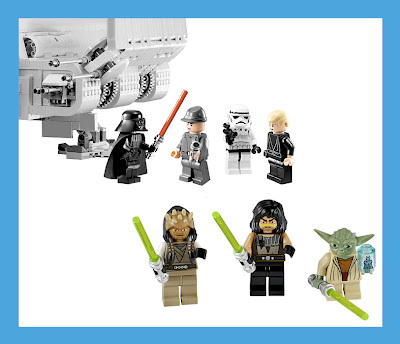 Plus the biggest success of them all, the mega-selling Star Wars sets. So Juno follows in a long tradition, this time with the emphasis on learning - no bad thing.